If you’re going to plan an October wedding, you might as well go big or go home. 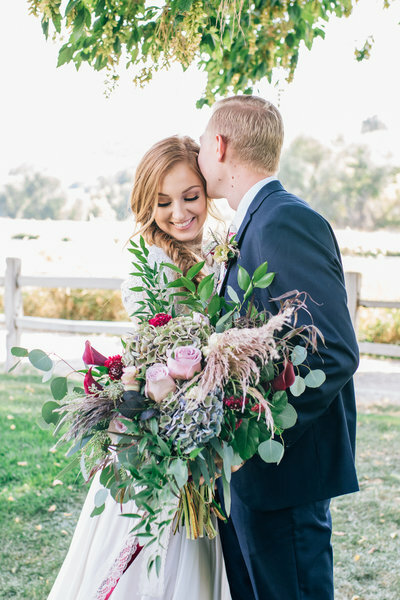 Jake and Lexi planned the most beautiful Fall Utah wedding. They were sealed in the Ogden LDS Temple on Friday, October 13th. They were greeted by many loving friends and family just outside the temple excited to share in the excitement of their wedding day. A reception followed that evening at The Gala Hideaway in Layton. It is an old barn converted into a stunning, rustic event center. There are tall wood rafters with crystal chandeliers and hanging bistro lights with touches of vintage throughout the room— old wooden windows, wood slices, an old ladder with hanging florals. The cake topper screamed Jake & Lexi. It fit their personality and wedding perfectly. The daddy/daughter dance pulled at your heart strings, the cake cutting made for some laughs, and the night ended with a fun sparkler exit. How does one narrow down sharing images from such a beautiful day?